An overwhelming sense of sadness overcame a neighbor this Thanksgiving morning when she could not find the strength to leave her home and celebrate Thanksgiving after hearing a kitten’s distant cry over the last few days. At about 10 A.M. on Thursday, November 23, 2017, San Dimas Station Deputies Romero and Mora responded to a residence located in the 5000 block of Conlon Street, Covina, after receiving a call from a neighbor concerned about a kitten that was possibly being abused. 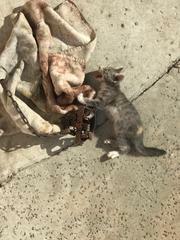 When the deputies arrived, they spoke with the neighbor who stated she had been hearing a kitten cry for a few days now, and was compelled to call authorities to check on the ailing kitten. The neighbor directed the deputies to a nearby residence where she believed the cries were coming from, and after deputies knocked on the front door of the residence to no avail, they hopped over that neighbor’s wall and entered the backyard. Once inside the backyard, Deputies Mora and Romero found the little, courageous kitten in pain and distress. 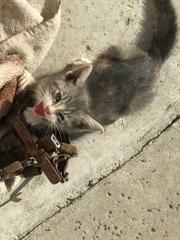 The kitten, whose paw was caught in the rusted steel-jaw trap, had been crying and meowing for help. Its paw appeared broken and severed, all while struggling to free itself in desperation. Deputies Mora and Romero quickly sprang into action. 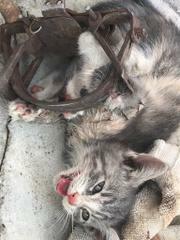 Using screw drivers to pry open the harsh metal clamps that were cutting into the kitten’s flesh, the deputies successfully freed the kitten. 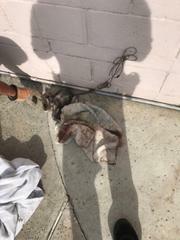 After its rescue, they tended to the kitten’s severed paw until the arrival of Los Angeles County Department of Animal Care and Control officers (LACDACC), who subsequently took possession of the kitten. It appears that the trap was in the yard to immobilize threatening animals away from a Koi fish pond that was also located in the backyard. According to LACDACC, the legalities of utilizing traps such as these will be addressed and/or investigated with the owner of the property. The Los Angeles County Sheriff’s Department is thankful for the opportunity to serve and save lives, including the life of a helpless animal. Anyone with information about this incident is encouraged to contact the Los Angeles County Sheriff's Department San Dimas Station at (909) 450-2700. If you prefer to provide information anonymously, you may call "Crime Stoppers" by dialing (800) 222-TIPS (8477), use your smartphone by downloading the "P3 MOBILE APP" on Google play or the App Store, or by using the website http://lacrimestoppers.org.